Original house planned for 6 to 8 people, 3 bedrooms, kitchen, dining room with lounge and a large bathroom. It has a shaded courtyard under the wisteria and a large sun terrace adjoining the pool. 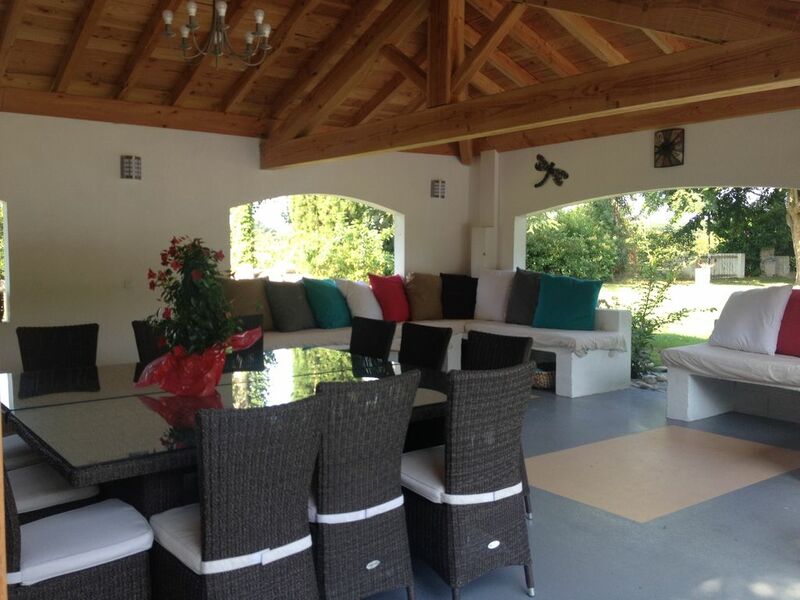 7 km east of Pamiers, easy access and fast, it is located in a property of 12 000m² which includes 2 houses in the heart of a park, a meadow and its barn. The whole is lined with trees then cultivated fields, calm and relaxation are guaranteed. This location is ideal for your getaways Ariège: the castle of Foix, the medieval city of Mirepoix, the thermoludic center of Ax les Thermes, the Cathar fortress of Montsegur, forges Pyrenees Montgailhard, the park of prehistory in Tarascon, multiple caves. If you want to go further, Toulouse, Carcassonne and Andorra will be less than an hour away. We can give you other suggestions of getaways on request (canyoning, canoeing, rafting, climbing, hiking, paragliding etc ....). You access a cottage by a country road along the orchard and then the vegetable garden and park your vehicles on the side of the house. In the park, you can discover various tree species, including two redwoods. Opposite the cottage, adjoining the pool, the pool house with its kitchen, bar and lounge will be your place of life from the arrival of spring to autumn because the weather is often at the rendezvous in our department . * For the nap you will appreciate the whole relaxation area with its large and comfortable banquettes, embellished with multiple cushions and coffee tables and a comfortable 140 x 200 mattress. Between the two, the swimming pool built, measures 8 meters by 4 with a beautiful rounded staircase for simple and progressive access for adults and children. It is equipped for the safety and comfort of an electric shutter. It is heated to a minimum temperature of 25 ° C.
If you like cycling and hiking, you will find a few meters from the property, a path of the road to Santiago de Compostela. In short, the ideal place to rest in the countryside and forget the hassle of city life. It is ideally placed for your getaways Ariege: Foix castle, the medieval town of Mirepoix, the spa center of Ax les Thermes, the Cathar fortress of Montsegur. If you want to go further, Toulouse, Carcassonne and Andorra are less than an hour away. Ménage en option (90 € le gîte et 150 € le gîte et le pool-house). Le pool-house et la piscine sont inclus dans le tarif de base du 1 juin au 30 septembre. Attention, ils sont en option le reste du temps et la piscine est en hivernage du 15 octobre au 15 avril (devis sur demande).